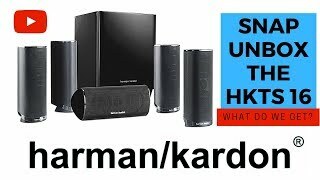 The 5.1 channel 120w home theater speaker system hkts16bq Home Theater is manufactured by HARMAN KARDON and was added around November 2018. This version of the Home Theater comes in Color : Black , Refresh Rate : 45 HZ , Meters : 1 Meter , Watts : 10 mAh , Dimensions : 734.06 x 365.76 x 353.06 mm. The best price for the Harman Kardon 5.1 Channel 120W in Saudi Arabia is SAR 1449 sold at Xcite and available with free shipping and delivery within Delivery within 24 Hours in Riyadh. 4-6 business days in other cities. By comparing prices and buying from the cheapest store you can save up to 46% or SAR 1250.